Technology flows at lightning speed. It's impossible to absorb it all - but there's bits and pieces that particularly intrigue, fascinate, inform, even give a leg up in these competitive times. Ellie, Cdin and Jamie glean various treasures amongst the fray and present them to you raw and unfettered... lots more coming soon! from one of our clients and wanted to share it with you. Please accept this letter of hearty recommendation to hire Cdin Jones - an excellent Web Designer. This is my story and I’m sticking to it! She’s an extraordinarily gifted and talented web designer. While it would be comforting enough to know that Cdin is quite TECHNICALLY qualified to create a wonderful web site for you, she’s ever so much MORE qualified than that. Cdin has the ability to know what questions to ask you to get a feel for your needs, tastes, etc. Then she has the rare gift to LISTEN to your responses and to TRANSLATE those responses into a proposed web site which is uniquely representative of your needs. Not only is Cdin extraordinarily talented at what she does, but she did my site in surprisingly fast time, checking my pulse every inch of the way. I highly recommend Cdin Jones as the best thing that could ever happen to your website. If you want to talk more to me about Cdin, first go to my beautiful website to check out Cdin’s work, and then call me to hear why I recommend Cdin as highly as I do. Oh yeah… A word of warning: I think Cdin’s the best. So when you call, be prepared to hear more glowing accolades! All 3 go together. We at CDI and Omni Integrations Associates smoothly integrate all parts into one efficient solution for you. Whether you run a business from office or home, use the Internet for communication, information, business or all three, the ever changing technology landscape can be daunting to traverse. We're here to help. We can guide you, advise you, and help make your journey fun, uplifting....and productive. So, specifically, what can we do for you? 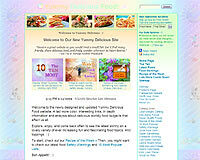 Cdincorp.com is happy to announce the creation of our very own Ellie and Cdin's, Yummy Delicious Food.com. 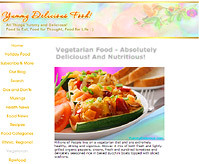 Ellie, Cdin and friends are putting their heart and soul into making this site the defining Web portal on what is the essence and definition of Yummy and Delicious in the fascinating International Food World. Heard from Ellie: "In the world of Food News, Views and Networking on the Web, our Yummy Delicious Food website will 'take the cake.'" Okay, Ellie, your comments aside, we'll be waiting with bated breath and forks ahoist. Revised © 2010 Cdin, Ellie & Friends, Subsidiary of CDI.